A new UN task-force has been set up to replace MONUSCO and tackle the DRC's many armed rebel groups, but without addressing the geo-political realities on the ground, it too may just prove ineffective. The new UN Security Council Resolution 2098, passed at the end of March this year, heralded the creation of a new UN Intervention Brigade in the DRC, with a mandate to “prevent the expansion of all armed groups, neutralize these groups, and disarm them”. The 3,069 strong group is drawn from a coalition of Tanzanian, Malawian and South African troops, and includes infantry and artillery battalions, an elite 'special force' and intelligence capabilities. Fueled by cross-border rivalries and oxygenated by government institutions riddled with corruption, the recent violence in the DRC has long proved difficult for the international community to resolve. This new brigade is therefore intended to bolster the reputation of MONUSCO - the UN's stabilisation mission in the region - which was widely considered operationally ineffective against the M23 rebels when the group seized towns and villages in the east of DRC last year. 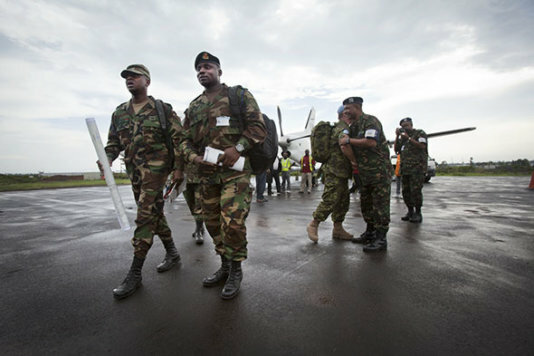 Whereas the creation of the Intervention Brigade raises hopes that a moment of real boots-on-the-ground engagement with the DRC'S many non-state armed groups has arrived, if the UN fails to engage with the economic, political and ethnic problems which caused MONUSCO to be so ineffective last year, it is unlikely that this new group will be strong enough to overcome these hurdles either. Firstly, MONUSCO's job has always been somewhat self-contradictory: it is required to protect the civilian population and reimpose the authority of the Congolese state, however it is the government - or at least many members of the governing class - that is often implicated in much of the violence in the first place. Secondly, the fact that MONUSCO drew troops from many different countries meant that there were a diverse set of troops with differing operational practices, and parallel command chains. This hampered MONUSCO's Chapter VII mandate to "use all necessary means…[to] ensure the effective protection of civilians”. Thirdly, MONUSCO is incredibly thinly spread. Its 17,000 troops and 3,000 civilian and police staff, are tasked with protecting a region the size of western Europe. This amounts to one MONUSCO soldier per 10-15 square kilometres. In addition to this, MONUSCO is under-equipped, with many contributing nations reluctant to send expensive up-to-date equipment to be used in an other country. 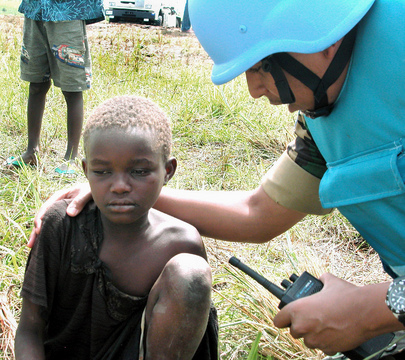 This means that MONUSCO is often slow to respond, and easily overwhelmed. If the new Intervention Brigade is to succeed, it is imperative that policy makers take care to prevent it operating along similar lines to its parent predecessor. With only 3,000 troops set up against 30-40 rebel groups, the UN must ensure that its new Intervention Brigade prioritises which groups to engage first, while also ensuring that the decision regarding which units tackle which rebel groups doesn't rouse suspicions as to each contributing country's wider political motives. As MONUSCO's previous problems already suggest, UN peacekeeping forces are most effective when both strongly united in purpose and supported with adequate resources. And yet, those same experiences also suggest that subtle differences between contributing nations often act to make missions less united than they initially appear. The violence in the DRC and surrounding regions has long been a scar on the humanitarian conscience of the international community, and - perhaps - with a good policy and diplomatic investment, a sustainable and effective solution just might be within the UN's reach this time.